Located in the colorful neighborhood of Retiro, the Mihanovich Tower was constructed in 1929. This neoclassic building is situated on Arroyo Street, which is well known today for its art galleries and antique stores. Today this magnificent building has been completely renovated to house the Sofitel Buenos Aires, a perfect combination of contemporary design with traditional and elegant Art Deco style. There are 144 rooms in all: 69 Superior Rooms, 46 Deluxe Rooms, 16 Junior Suites, 10 Deluxe Suites, 2 Executive Suites, and 1 Apartment. All rooms are equipped with: Air-conditioning with in-room control, safe-deposit box, minibar, cable television, two telephone lines with DDN-DDI, private telephone number and voice mail, work desk, high-speed internet access, smoke detectors and sprinklers, bathrooms with separated shower and bathtub, telephone extension, hair dryer and bathrobe. Bath products by Jean Marie Farina, Roger & Gallet Luxury Line. And last, but not least, daily fresh flowers. 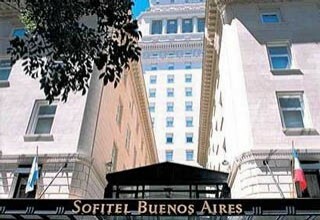 Sofitel is just minutes away from Recoleta, Colonial Opera House, Obelisco, Torre de los Ingleses, Plaza de Mayo, and Puerto Madero. The hotel's restaurant offers Mediterranean gourmet cooking based on the recipes and flavors of La Provence. There is also a private library, decorated with an English flare, large chimney, Argentine paintings, and leather armchairs and cushions. La Bibliothque boasts Argentine and French literature, with a notable collection of books on design, architecture, landscape, and history. This charming spot is the perfect place to order a drink while enjoying a book. The Business Center has two workspaces fully equipped with PC, printer, broadband internet connection, and private, direct telephone lines. In addition, the center offers guests a photocopy machine, fax, translation services, laptop computer rental, cellular telephone rental and messenger services. And lest you worry you are missing your daily workout, a fully equipped Fitness Center complete with personalized trainers is at your service. The center also offers a heated pool, locker rooms, and all the amenities of a luxury hotel.